Rothenstein did not like to think of himself as a scholar and would claim in the memoirs he wrote in the early 1930s that ‘I was never a real student of the arts, and preferred pottering about the streets in my spare time looking for bargains, to studying seriously in overcrowded museums’.2 In 1899, however, his fellow artists may have been forgiven for thinking otherwise. He was, after all, in the final stages of producing the first ever English monograph on the Spanish artist Francisco Goya (1746–1828; fig.1) which would be published the following year as part of Laurence Binyon’s series The Artist’s Library: one of many beneficiaries of the significant boom in arts publishing in the 1890s.3 Rothenstein’s book was an expansion of two essays he had written on Goya for the Saturday Review in 1896 following a trip to Spain with Robert Cunninghame-Graham the previous year.4 Although the books in Binyon’s series were short and aimed at a wide audience, there is no doubting that Rothenstein took his role seriously. His interest in art history was not that of the amateur: he read widely, studied material first-hand, and moved in circles in which a firm grasp of the old masters was almost expected. That which he started in London, he clearly continued in Paris. The presence of a copy after Velázquez’s Pablo de Valladolid 1636–7 in the artist’s Paris sketchbook – taken, most likely, from a reproduction, as the picture was in Madrid – is typical of the period.10 Velázquez’s reputation, bolstered by Édouard Manet and James McNeill Whistler, was reaching new heights which would come to something of a climax in R.A.M. Stevenson’s influential study The Art of Velasquez (1895), which made a distinct case for the artist’s modernity. Other works that made a great impression on Rothenstein in Paris were Fra Angelico’s The Coronation of the Virgin 1430–2 (Musée du Louvre, Paris) and two works by Rembrandt: The Slaughtered Ox 1655 (fig.2) and The Good Samaritan c.1650 (now attributed to a ‘follower of Rembrandt’; Musée du Louvre, Paris).11 One wonders whether Rembrandt’s ox carcass lay behind his decision to paint the Vattetot painting The Butcher’s Shop under the Trees (Tate N05946), despite the relative smallness (and tameness) of the butchered meat in Rothenstein’s canvas. Not mentioned in his memoirs, but surely exerting a similarly powerful influence, was Rembrandt’s Philosopher in Meditation 1632 (fig.3), which must have also been in Rothenstein’s mind when he started painting The Doll’s House. Later in life John would write that ‘the aspiring student who thinks he may best find himself by pursuing the Old Masters is in grave danger of losing sight of his guides as well as his goal. He must take his directions, as did his distinguished predecessors, from life itself’.12 It is very likely that John was thinking of his own training, if not that of many of his contemporaries who, like Rothenstein, were steeped in the culture of the old masters. 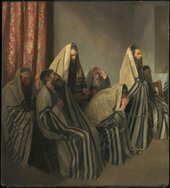 Rothenstein would no doubt have agreed with John that it was important not to be overly influenced by any one artist: a fault he attributed to artists such as Charles Ricketts.13 Indeed, a review by D.S. MacColl, written in 1900, suggests that Rothenstein was perceived by many to have struggled to overcome his influences. ‘I see that the critics, when they have not described Mr. Rothenstein’s painting as a slavish imitation of the Old Masters … have dismissed it as “clever work in the latest manner of the Parisian studios”’, wrote MacColl.14 Despite this accusation – with which MacColl disagreed – it is clear that Rothenstein strongly encouraged John and others to pursue the old masters at the turn of the century. In letters sent to his parents in 1898 Albert Rutherston wrote of how William was keen for him to copy from works at the National Gallery, as he had done previously.21 Albert duly obliged, returning with the obligatory copy of a Rembrandt head. Only months later Albert reported back from a whole exhibition of work by the Dutch master: ‘I went to the Rembrandt show which almost takes one’s breath away it is so marvellous. Of course I shall go again’.22 The show in question was the retrospective at the Royal Academy, which opened in January 1899 followed in March by an exhibition of works on paper at the British Museum. These two shows came in the wake of the major 1898 Rembrandt exhibition in Amsterdam, which attracted over forty-three thousand visitors during its two-month run, and has been described as the birth of the modern ‘block-buster’ exhibition.23 The impact of these three exhibitions and their associated publications was huge, ensuring that the subject of Rembrandt was an unavoidable one in artistic circles c.1900. In a study of Rembrandt’s reputation Catherine Scallen refers to the 1890s as the ‘Rembrandt Decade’.24 The first of eight volumes of the first fully illustrated catalogue raisonné was published by Wilhelm von Bode and Cornelius Hofstede de Groot in 1897, while new works flooded into the market, achieving increasingly high prices. Although the arrival of American collectors was a key factor, signalling something of a power shift in the international art market, a significant number of works by Rembrandt were in British hands at this point, as British critics were keen to point out in their reviews of the Amsterdam exhibition. ‘It is satisfactory to British people to know that by far the finest pictures in private hands were contributed by collectors in England and Scotland’ noted one proud critic in the Art Journal in December 1898: a factor which explains why London was able to host two independently organised Rembrandt exhibitions the following year.25 London asserted its right to be seen as the centre of Rembrandt appreciation, treating the artist as if he had been one of their own. These paradoxical expressions – palpable reality and spiritual fact – are evocative of a phrase Oscar Wilde used in 1889 to describe the work of the writer Honoré de Balzac, ‘imaginative reality’, a phrase Rothenstein adapted in turn to define the temperament of Goya: ‘an imagination for reality’.32 They suggest that Rembrandt was perceived as something of a cross between the realist and the symbolist: an artist whose visual compromises were at the service of a greater human ideal – to uncover reality itself.33 In Rembrandt lay the key to what Rothenstein would refer to as life’s ‘hidden forces’ or ‘eternal verities’.34 In this sense, he was the perfect model for an artist at the turn of the century, trying on the one hand to escape the intricate, cluttered realism of artists such as Luke Fildes (see, for instance, The Doctor exhibited 1891, Tate N01522; fig.4) and on the other the rich and hazy symbolism of George Frederic Watts (see Hope 1886, Tate N01640; fig.5) or Edward Burne-Jones. Rembrandt pointed the way to a constructive middle-ground, in which the formal qualities of a painting became more important, but not yet at the total expense of a realist narrative. The simplification of form was not pursued in and of itself, but in the service of a higher reality. Paintings were still ‘about’ something – it was simply less clear what the subject was, beyond that of ‘the poetry of human life and human endeavour’ (a phrase later used by J.B. Manson to describe the central theme of Rothenstein’s work).35 The trick – which Rembrandt was perceived to have pulled off again and again – was to represent everyday life in such a way as to represent humanity in general. As Rothenstein would write of his later interiors: ‘I was painting wife and child, and wished to suggest every-wife and every-child’, a passage that is reminiscent of the French critic Champfleury’s comments on Gustave Courbet’s famous painting The Burial at Ornans 1849–50 (Musée d’Orsay, Paris) as being ‘the representation of a burial in a small town, which nonetheless stands for burials in all towns’.36 The downside of the approach was that it demanded a lot from the viewer: what if they didn’t see every-child in the specific child? This thorny question lingers behind comments Max Beerbohm made concerning Rothenstein’s art in 1926: ‘Even if he be painting a barn or a tree, a cart or a hedgerow, [Rothenstein] seems to be saying: “What is this object? Just what part does it play among the eternal verities? And just how can I best pluck the heart out of it?” I cannot pretend to answer such questions.’37 Later criticism has shown less reluctance to shy away from the issue, with Ysanne Holt suggesting that old master allusions in the art of Rothenstein and his friends serve to obfuscate the social realities of the period: that by claiming to pursue reality, they were in fact leading their viewers down a blind art historical alley.38 The Rembrandt-like mood of The Doll’s House could therefore be seen as a means of legitimising potentially disturbing subject matter or making it more palatable to a collector. The same could have been written of Rembrandt. Indeed, the works to which Fry was probably referring in this passage – a series of paintings Rothenstein made of the Jewish East End of London between 1903 and 1908 – directly evoked the Dutch master. Although Rothenstein’s own Jewish identity and the political debates surrounding Jewish immigrants (culminating in The Aliens Act of 1905) form an important context for such works as Jews Mourning in a Synagogue 1906 (Tate N02116; fig.6), Rothenstein’s lingering interest in Rembrandt was crucial, as he himself admitted. ‘Here were subjects Rembrandt would have painted,’ he wrote, recalling his first visit to an East End synagogue, describing the ‘old gray-bearded men’ he saw there as having the ‘pathetic look of Rembrandt’s Rabbis’.41 It is as if it was the connection to Rembrandt and not the personal exploration of Jewish culture that provided the real spur to paint in Whitechapel. Finally Rothenstein had the opportunity to concentrate on images of old men: a subject he had long coveted and which he had always associated, again, with Rembrandt.42 Rothenstein was perhaps being wily here: he knew that his paintings would probably reach a wider audience if seen as Rembrandt-style studies of humanity as seen through praying Jews, rather than esoteric, quasi-documentary studies of a specific community in London.43 However, it is also a reminder of the extent to which the Dutch artist – whose influence was first felt, and self-consciously celebrated, in The Doll’s House – continued to steer the artist’s thoughts. 1. A summary of Edwardian interest in the old masters is provided by Barbara Pezzini, ‘InterNational Art: The London “old-masters” Market and Modern British Painting (1900–1914)’, in Art Crossing Borders: The Birth of an Integrated Art Market in the Age of Nation States (c.1780–1914), Leiden 2016, n.p. For more on the late-nineteenth and early twentieth-century art market in general see Pamela Fletcher and Anne Helmreich (eds. ), The Rise of the Modern Art Market in London, 1850–1939, Manchester 2011. 2. William Rothenstein, Men and Memories, 1900–1922, vol.2, 1932, p.230. 3. 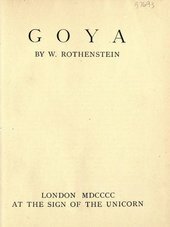 For more on the Goya articles and Rothenstein’s relationship to art historical scholarship, see Samuel Shaw, ‘“Scarcely a scholar”: William Rothenstein and the Artist as Art-writer in English Periodicals, ca.1890–1910’, Visual Resources: An International Journal of Documentation, vol.31, nos.1–2, 2015, pp.45–60. 4. William Rothenstein, ‘Goya I’, Saturday Review, 5 September 1896, p.235, and William Rothenstein, ‘Goya II’, Saturday Review, 13 September 1896, pp.307–8. The trip to Spain is described in William Rothenstein, Men and Memories, 1872–1900, vol.1, 1931, pp.215–25. 5. Rothenstein 1931, vol.1, pp.22–4. The British Museum’s Prints and Drawings Room, where Laurence Binyon would work from 1895, would subsequently become a significant meeting place for Rothenstein and his circle in the mid- to late-1890s. 7. Ibid., pp.25, 20. The National Gallery work was probably the painting now classified as An Elderly Man as Saint Paul. 9. Augustus John, ‘Will Rothenstein’, in Sir William Rothenstein, 1872–1945: A Memorial Exhibition, exhibition catalogue, Tate Gallery, London 1950, p.4. Elsewhere Rothenstein notes buying two Rembrandt drawings for five shillings and later selling them for two hundred pounds. Rothenstein 1931, pp.239–40, and Rothenstein 1932, p.288. 10. For further discussion of this drawings and others in Rothenstein’s Paris sketchbook, see Samuel Shaw, ‘Rothenstein in France’, February 2016, in Samuel Shaw (ed. ), In Focus: ‘The Doll’s House’ 1899–1900, by William Rothenstein, February 2016. 12. Augustus John, Autobiography, London 1975, p.418. 13. ‘The tendency to study works of art too enthusiastically, to reflect the appearance of mastery rather than to enter, like the spirit of the Chinese artist in the legend, the heart of nature herself, is perhaps a weakness of English painters’, Rothenstein claimed with reference to Ricketts. Rothenstein 1931, pp.174–5. 14. D.S. MacColl, ‘The Society of Portrait Painters’, Saturday Review, 1 December 1900, vol.90, p.679. 15. See Samuel Shaw, ‘“The new ideal shop”: Founding the Carfax Gallery, c.1898–1902’, British Art Journal, vol.13, no.2, 2012, pp.35–43. 17. See ibid., p.4, for a full list of the exhibitions held at Carfax. 19. 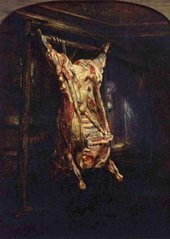 References to the old masters were also common in the work of Rothenstein’s brother-in-law William Orpen, Velázquez and Rembrandt being two of the leading influences. 20. By focusing on Rembrandt’s influence on artists at the turn of the century, this essay does not mean to deny his influence in earlier decades, especially on those artists associated with the Etching Revival. 21. Albert Rutherston, letter to Moritz and Bertha Rothenstein, 19 April 1898, Tate Archive TAM 50/1. 22. Albert Rutherston, letter to Moritz and Bertha Rothenstein, 13 January 1899, Tate Archive TAM 50/4. 23. Francis Haskell, The Ephemeral Museum: Old Master Paintings and the Rise of the Art Exhibition, New Haven 2000, p.102. 24. Catherine Scallen, Rembrandt, Reputation, and the Practice of Connoisseurship, Amsterdam 2000, pp.127–80. 25. Anon., ‘The Rembrandt Exhibition’, Art Journal, December 1898, p.356. 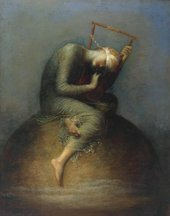 As Scallen points out: ‘only six of the paintings on view in London were from non-British collections … it is reasonable to view the London show as a response that championed British taste, wealth, and cultural imperialism, and emphasised the importance of the arts as an instrument of national identity in the nineteenth century. Queen Victoria’s loan of nine paintings … further underscored this meaning’. Scallen 2000, p.155. 26. Walter Armstrong, ‘Rembrandt: Amsterdam and London’, Magazine of Art, January 1899, p.222. 27. ‘Rembrandt as Rebel’ is the title of a chapter from C.J. Holmes’s Notes on the Art of Rembrandt, London 1911. 28. Karl Beckson and Mary Lago, Max and Will: Max Beerbohm and William Rothenstein, Their Friendship and Letters, 1893–1945, Cambridge 1975, p.9. This suggests that Rothenstein attended the Rembrandt exhibition in Amsterdam; he almost certainly saw the two shows in London. 30. William Rothenstein, Goya, London 1900, p.6. 31. Frances Low, ‘Impressions of the Rembrandt Exhibition in Amsterdam’, Pall Mall Magazine, January 1899, p.98. 32. Rothenstein 1900, p.28. Wilde used the phrase in his essay ‘The Decay of Lying – An Observation’, in Intentions, London 1891. 33. Navigating the terrain between realism and symbolism was also an important factor in the work of Walter Sickert. See David Peters Corbett, Walter Sickert, London 2001. 35. James Bolivar Manson, ‘The Paintings of Mr. William Rothenstein’, The Studio, vol.50, 1910, p.42. 36. Rothenstein 1932, p.32. Champfleury’s comment – ‘qu’elle est la représentation d’un enterrement dans une petite ville, et qu’elle reproduit cependant les enterrements de toutes les petites villes’ – was made in his 1855 letter to Madame Sand: see Geneviève and Jean Lacambre (eds. ), Le réalisme: Champfleury, Paris 1973, p.176. 37. Max Beerbohm, ‘Preface’, in John Rothenstein (ed. ), Portrait Drawings by William Rothenstein, London 1926, p.xii. 38. In Holt’s words: ‘By insisting, aesthetically and metaphorically, on past conventions it was possible for artists and spectators to overlook actual diversity, insistent and unpleasant real poverty, the new geographies and the developing suburbanisation of the 1890s’. Ysanne Holt, ‘London Types’, London Journal, vol.25, no.1, 2000, p.47. 39. In 1910, responding to a lecture on Indian art, Rothenstein argued that ‘if artists had only realised earlier in their Western art the value of Eastern ideas … Western art would have an entirely different character’. Western artists, he noted, had only now begun to see that ‘reality and realism were not the same thing, and that the essence of art was reality’. ‘Proceedings of the Society: Indian Section’, Journal of the Royal Society of Arts, vol.58, no.2985, February 1910, pp.273–98. 40. Roger Fry, ‘The Art of Mr. Rothenstein’, Nation, 11 June 1910, pp.382–3. 43. So it proved: rather than relate a painting such as Aliens at Prayer 1906 (National Gallery of Victoria, Melbourne) to the political situation (as the title merits), the critic of the Athenaeum noted how the artist ‘has sunk himself into his subject, as Rembrandt did’. ‘“Independent Art” at Messrs Agnew’s’, Athenaeum, 17 February 1906, p.206. Samuel Shaw, ‘Rembrandt and Reality’, in Samuel Shaw (ed. ), In Focus: The Doll’s House 1899–1900 by William Rothenstein, Tate Research Publication, 2016, https://www.tate.org.uk/research/publications/in-focus/the-dolls-house-william-rothenstein/rembrandt-and-reality, accessed 22 April 2019.